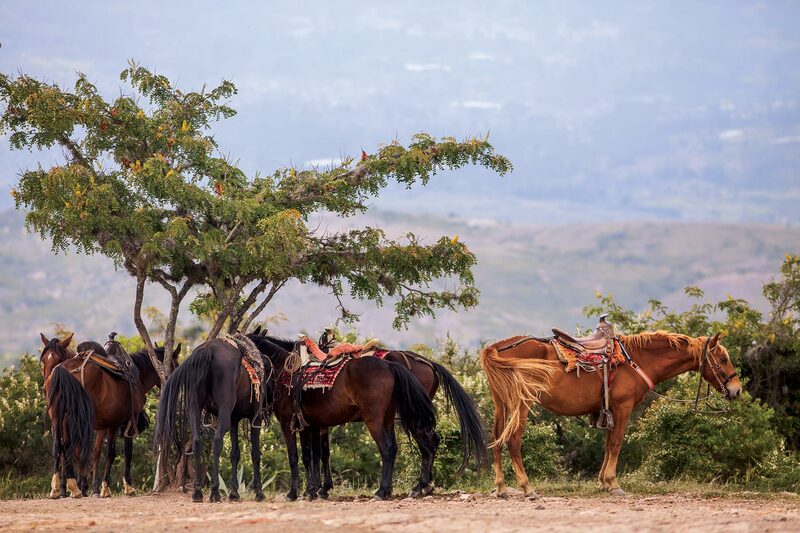 Part 3 of a behind-the-scenes look opXpeditions: Colombia, an OutpostTV show. Watch it here. They were still cleaning up the Plaza Mayor when Team Outpost arrived. The previous night thousands had gathered to celebrate Little Candles Day (Día de las Velitas), a holiday marked by lighting lanterns, candles and fireworks. It’s a big deal in Colombia and rings in the unofficial start of the Christmas holiday season (on December 7). The square itself almost seemed to be nursing a hangover that morning, as cleaners swept the cobbled streets. I could almost hear the town itself murmur, Lo siento. No estoy en mi mejor momento—I am sorry, I’m not at my best. Villa de Leyva is Colombia’s festival-central; but when it’s not hosting one of its many annual events—for kites and independent film, among other things—it is a picture-perfect, relatively tranquil colonial town of 10,000 people. Founded way back in 1572, in a valley 2,000 metres up in the Andean highlands, it’s considered one of the finest examples of a colonial town in Colombia. Lately, more and more people from Bogotá (four hours by car and a common tourist day trip) have been drawn to its historic streets and pleasant, dry climate. Rolos (people from Bogotá, as I mentioned earlier) aren’t the first ones to appreciate Villa de Leyva. In previous centuries, it was a retreat for military officers, clergy and nobility, and was declared a national monument in 1954. But the town itself isn’t all there is to this corner of Colombia; the entire area beckons visitors and explorers. Beyond the 17th-century churches and Spanish-style villas awaits a landscape of undulating hills. There are many ways to explore the countryside, including by 4×4 and quad-bike tours. Team Outpost opted for a quieter option and mounted horses. It was a meandering affair through the badlands that led us first to the turquoise mineral-rich waters of the Pozos Azules. He took in the views, then trotted on to El Fosil, a museum just outside Villa de Leyva. Here, we were treated to a ginormous 110-million-year-old kronosaurus boyacensis fossil, which was uncovered in 1977 by a farmer tilling his field. This baby—literally, it was a baby—is seven metres long without its tail (estimates put its total length at 12 metres, all in). At that size, I shuddered to think of getting between junior and Mister and Missus Kronosaurus. We traded our four-legged transportation for a pickup truck and sped along the dirt roads, leaving a dust cloud in our tracks. In time, we piled out of the truck at the Muisca astronomical observatory, an archaeological site dating back almost two millennia. Dozens of phallic-shaped sandstone monoliths dotted the grassy field, which were used by the ancient Muisca Indians to calculate the planting seasons based on the stones’ alignment with the sun and moon. When the Spanish arrived they were none too pleased to see the local indigenous using the site for “pagan” ceremonies, so they nicknamed the place Little Hell (El Infiernito). Our guide Andrés was clearly moved to be there. For him, the astronomical observatory isn’t just another archaeological site. It’s a powerful reminder of his own indigenous ancestors. As the sun was beginning to set, we headed back to town, wondering what celebration might be awaiting us that night.